Prevention, early detection and treatment: Those are the three pillars guiding cancer research at Vanderbilt-Ingram Cancer Center where Pierre Massion, MD, who holds the Cornelius Vanderbilt Chair in Medicine and is the Ingram Professor of Cancer Research, has been named to direct VICC's Cancer Early Detection and Prevention Initiative. The focus is directed at expanding campus-wide research and addressing the critical issues in early detection and prevention for a host of leading cancers. "We're trying to make progress in lung cancer management and therapeutics, but people universally recognize that it's difficult to cure cancer," Massion said of the three-pronged mission. "The best chance to have a large impact on the population is through prevention because it's very difficult to move the needle once people already have cancer." 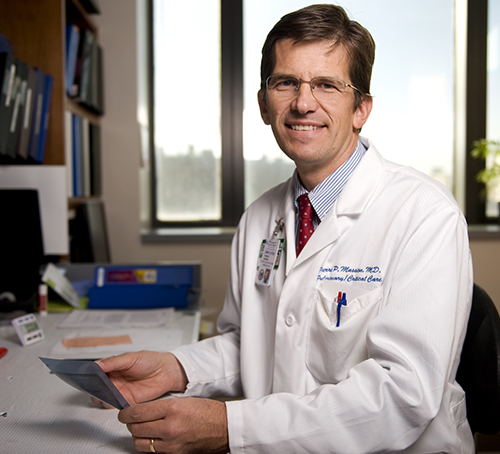 In comparing strategies for detection and intervention of lung cancer, Massion said 12,000 lives a year could be saved through early detection, while 2,500 advanced-stage lung cancer patients could be saved through progress in chemo and targeted therapies. "The biggest news since 2011 in the field of early detection is that we know screening decreases relative risk for lung cancer mortality by 20 percent," he said. "Many centers are striving to engage in early detection, and Vanderbilt recognized this and wanted to develop an initiative to encourage investigators to study these problems and tackle early detection and prevention, specifically at a cancer center." A 17-year veteran of Vanderbilt, the pulmonologist stepped in to lead the initiative when it launched in 2016. "This is an exciting, forward-thinking position, and we're trying to readjust disparities in funding and efforts." Massion has dedicated his career to developing strategies for early detection of lung cancer and is driven by the goal of finding better strategies to identify those at greatest risk. In January, his laboratory, in collaboration with researchers in the Schools of Medicine and Engineering at Vanderbilt University, announced discovery of a proteomic "signature" from the airways of heavy smokers that could lead to better risk assessment and perhaps new ways to stop lung cancer before it starts. Their findings, reported recently in the journal JCI Insight, are based on the observation that otherwise normal-looking cells in the epithelial lining of the lungs of heavy smokers and others at high risk for lung cancer undergo the same kind of "metabolic reprogramming" as do cancer cells. Massion, who served as senior investigator of the study, said the team was trying to answer the question of why and how cancer cells develop in the airways. "We wanted to know what molecular changes are happening in the airways of people at different risks, from the young who don't smoke to those at high risk," he said. The group took brushings of airways (windpipes) to quantify risk of developing lung cancer and methods to identify changes. "Along with increased risk in the airways, people develop a lot of changes in proteins that regulate metabolism into cells," he explained of the findings. "Cells are growing and living in the airways, but as your risk increases and with smoking, some metabolic enzymes get more expressed and specific metabolic pathways change." Using another method, researchers conducted the same study on a different group of patients at equally low, moderate and high risks. Their results were similar: Cells that look completely normal had undergone profound metabolic changes similar to the changes in cancer cells but without cancer. That discovery led to more questions including how cells update glucose, produce lactate, and deal with oxidized stress and glutamine demand. "This is relevant because we're closer to understanding how changes in cellular metabolism affect genomic instability," Massion said. "The next step is to understand how metabolic programming facilitates genomic instability, which is a known requirement for the development of cancer." The findings have resulted in much excitement in the scientific world, as there are proven ways to prevent metabolic changes from happening. "We're interested in understanding how metabolism in the airway affects immune response and how eventually some people develop lung cancer because their immune response was impaired for some reason," Massion said. "A lot revolves around immunology oncology in lung cancer." Vanderbilt University Medical Center is one of only a few academic medical centers in the country with a dedicated hospital-wide tobacco treatment service (TTS). Launched in 2015, the Vanderbilt Center for Tobacco, Addiction and Lifestyle (ViTAL) treats an estimated 3,500 patients annually. A tobacco treatment service provides evidence-based care to tobacco users who have been identified from the electronic health record as a current or former smoker. Certified Tobacco Treatment Specialists proactively visit patients to assess use and patterns, as well as to provide counseling and smoking cessation aids to manage nicotine withdrawal. Initiating smoking cessation treatment while a patient is hospitalized has been shown to increase long-term quit rates by 40 percent or higher.